Mauricio Zottarelli quintet will perform at the Iridium stage for the first time! Come out to support the band and this wonderful venue! The show will feature Mauricio's compositions and arrangements from his record "7 Lives" plus new material. Don't miss it! I am very happy to share these two video lessons, which are part of a series of videos coming up on my YOUTUBE CHANNEL, called #MZDRUMS VIDEO TIPS (subscribe to the channel HERE). Also, both videos have a free PDF download that will help you follow the lesson and practice on your kit! The first one is a BASS DRUM EXERCISE - This is a cool exercise to improve your bass drum control, technique, groove - and it will help your overall feel and groove on the kit. Also, it's a nice coordination workout! The next one is called PARADIDDLES WITH BASS DRUM HITS - it's an interesting way to practice your paradiddles with the hands, and try different hits with the bass drum. This exercises will help your coordination, groove, time, and will open up possibilities between hands and feet. For those of you that have had difficulties playing through some of the material from the lesson "Bass Drum Exercise", this will also work as a nice introductory exercise to that lesson. Give it a try, and grab the PDF to read and practice along. Thank you! Feel free to share these, and happy practicing - see you next time! I am extremely happy and grateful to be included once again on the Best Of The Year list from the prestigious blog/website "Jazz Station" from Arnaldo DeSouteiro. I made it among the 5 best drummers of 2014, and my record "Glasses, No Glasses" is among the 20 best albums of 2014! This is the 4th year in a row that I am included on the "Best of" list from Jazz Station. The list is one of the most respected and prestigious on the jazz circuit, and it exists since 1979. Many thanks also to all these companies for their support, partnership and for believing in what I do! It's always an honor to be featured on this great drum magazine, Modern Drummer Magazine Brazil. 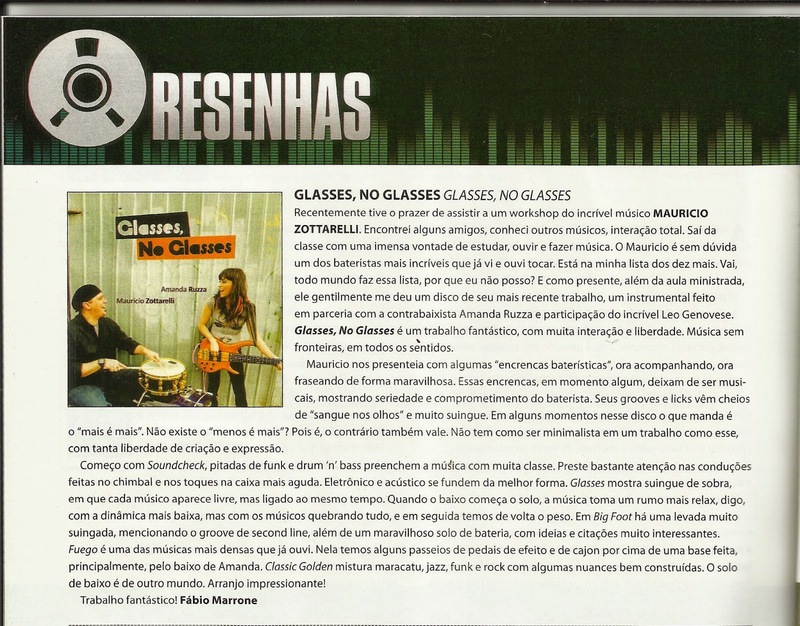 Here's a review of my album with Amanda Ruzza, Glasses, No Glasses which was published in November 2014. Below are the portuguese and english versions. Thanks for reading and for the constant support! "I recently had the pleasure of attending a workshop from the incredible musician Mauricio Zottarelli. I saw some friends there, I met other musicians, it was total interaction. I left the class with an immense desire to study, listen and make music. Mauricio is undoubtedly one of the most amazing drummers I've seen and heard playing. He's in my top ten list. Come on, everyone has a list like this, why can't I? And as a gift, besides the class that he taught us, he kindly gave me a copy of his latest disc, an instrumental project done in collaboration with bassist Amanda Ruzza and featuring the amazing Leo Genovese. Glasses, Glasses is a fantastic work with lots of interaction and freedom. Music without borders or limits, in every way. Mauricio presents us with some great and tricky drumming passages, sometimes accompanying, or sometimes phrasing wonderfully. But these passages never cease to be musical, showing the drummer's seriousness and commitment. His grooves and licks are full of swing, power and precision. At times, the message that prevails on this record is "more is more". Haven't we all heard about the concept of "less is more"? Well, the opposite is also true. And there's no way be minimalist in a project like this, with so much creative freedom and expression. It begins with Soundcheck, with touches of funk and drum 'n' bass filling the music with a lot of class. Pay close attention to how he rides on the hi hat, and how he uses the higher pitched snare. Electronic and acoustic both merging in the best way. Glasses shows tons of swing, with each player being very free but also connected simultaneously. When the bass solo begins, the music takes a more relaxed turn, with lower dynamics, but the three musicians are still tearing it up, and soon after the track gets powerful again. Big Foot has a second-line groove that is very swinging, and a wonderful drum solo, with very interesting ideas and phrases. Fuego is one of the densest songs I've ever heard. It features several effect pedals and also a Cajon, over a base made mainly by Amanda's bass. Classic Golden blends maracatu, jazz, funk and rock with well-built nuances. The bass solo is from another world. Very impressive arrangement! "Recentemente tive o prazer de assistir a um workshop do incrível músico Mauricio Zottarelli. Encontrei alguns amigos, conheci outros músicos, interação total. Saí da classe com uma imensa vontade de estudar, ouvir e fazer música. O Mauricio é sem dúvida um dos bateristas mais incríveis que já vi e ouvi tocar. Está na minha lista dos dez mais. Vai, todo mundo faz essa lista, por que eu não posso? E como presente, além da aula ministrada, ele gentilmente me deu um disco de seu mais recente trabalho, um instrumental feito em parceria com a contrabaixista Amanda Ruzza e participação do incrível Leo Genovese. Glasses, No Glasses é um trabalho fantástico, com muita interação e liberdade. Música sem fronteiras, em todos os sentidos. Mauricio nos presenteia com algumas "encrencas baterísticas", ora acompanhando, ora fraseando de forma maravilhosa. Essas encrencas, em momento algum, deixam de ser musicais, mostrando seriedade e comprometimento do baterista. Seus grooves e licks vêm cheio de "sangue nos olhos" e muito suingue. Em alguns momentos nesse disco o que manda é o "mais é mais". Não existe o "menos é mais"? Pois é, o contrário também vale. Não tem como ser minimalista em um trabalho como esse, com tanta liberdade de criação e expressão. Começo com Soundcheck, pitadas de funk e drum 'n'bass preenchem a música com muita classe. Preste bastante atenção nas conduções feitas no chimbal e nos toques da caixa mais aguda. Eletrônico e acústico se fundem da melhor forma. Glasses mostra suingue de sobra, em que cada músico aparece livre, mas ligado ao mesmo tempo. Quando o baixo começa o solo, a música toma um rumo mais relax, digo, com a dinâmica mais baixa, mas com os músicos quebrando tudo, e em seguida temos de volta o peso. Em Big Foot há uma levada muito suingada, mencionando o groove de second line, além de um maravilhoso solo de bateria, com ideias e citações muito interessantes. Fuego é uma das músicas mais densas que já ouvi. Nela temos alguns passeios de pedais de efeito e de Cajon por cima de uma base feita, principalmente pelo baixo de Amanda. Classic Golden mistura maracatu, jazz, funk e rock com algumas nuances bem construídas. O solo de baixo é de outro mundo. Arranjo impressionante!